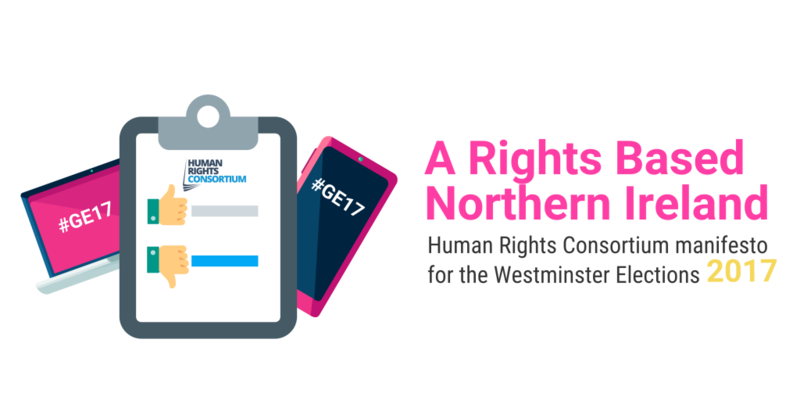 The Human Rights Consortium has presented a series of challenges to parties and candidates running in the 2017 Westminster elections in Northern Ireland. ‘A Rights Based Northern Ireland’ is an outline of the human rights and equality priorities the Consortium believes that political parties should be pursuing in order to make Northern Ireland a more human rights based society. The manifesto sets out a range of current threats to human rights in Northern Ireland and suggested responses. Covering issues from Brexit, the threatened repeal of the Human Rights Act (HRA), proposals to withdraw the UK from the European Convention of Human Rights (ECHR), the duties of the UK to comply and adopt International human rights standards and the unfulfilled Bill of Rights for Northern Ireland. The Consortium will be presenting their list of priorities to political parties and representatives in the coming weeks. Given the current storm of challenges to human rights at a local, regional and global level the Consortium believes that the Westminster Parliament and its representatives have a key role to play in securing and advancing existing human rights protections in Northern Ireland. Retain existing EU derived Human rights and equality protections. Ensure no race to the bottom on any Brexit agreement between political parties. Develop a Northern Ireland Bill of Rights as a vehicle to transpose EU revived Human Rights and Equality protections. Retain and protect the Human Rights Act. Develop a Northern Ireland Bill of Rights in a manner consistent with the Belfast/Good Friday Agreement so as to incorporate the ECHR. Use the Northern Ireland Bill of Rights to download international human rights standards into local law. The full text of the document can be downloaded below.